AKiTiO is committed to protecting the privacy of our customers. This statement is meant to inform our users regarding the ways in which we define, gather and utilize personally identifiable information. AKiTiO will take reasonable steps to protect user privacy consistent with the guidelines set forth in this policy and the applicable laws. As a standard practice, AKiTiO records certain information from your device, including MAC address, IP address, Registration Name and Firmware Version when it's connected to the internet. AKiTiO does not know the identity of the user unless the user specifically informs us. We use this information to provide services like the web portal and automatic firmware updates. We also analyze this data for trends and statistics, such as general location and time when the device is online. We use all this information in order to improve our services, assure uninterrupted connections, and measure overall server effectiveness, and therefore to make the user experience better and hopefully more fitting to your needs. If you would prefer that your device does not send this kind of information to AKiTiO, you can disable the portal server and the automatic firmware update. However, please keep in mind that you will no longer be able to access your device through our web portal at http://myakitio.com after that. To disable the portal server, go to Preference > Portal Server, uncheck the option to 'Enable Portal Server' and then click Apply. The service has now been stopped and the device is no longer reporting its MAC address and IP address. 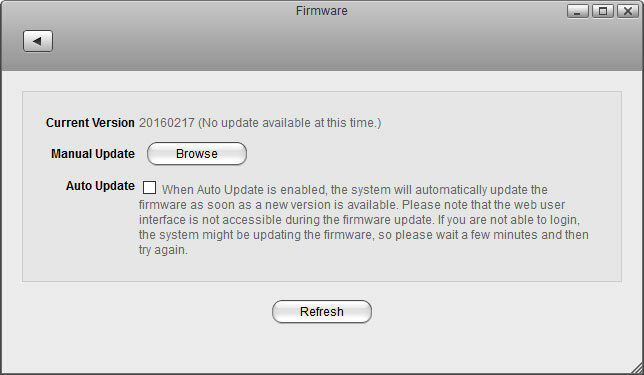 To disable the automatic firmware update, go to Preferences > Firmware and uncheck the option for 'Auto Update'. The device will no longer check for available firmware updates. If you would like us to completely remove your previous records (e.g. IP address) from our web portal, please contact us at privacy@akitio.com and let us know the MAC address of your device. When you contact AKiTiO, we may ask you to complete forms that request certain information from you, including financial information such as purchase order and general contact details. To provide better customer service, we may also ask you for details about your device, including media content, network environment, personal computer or mobile device. When entering personal or business related data, the disclosure of the data takes place on a completely voluntary basis. By entering the data you give your consent to the collection, processing and use of the same for purposes of establishing contact with regard to advising and supporting our customers and products. Personal data will only be collected to an extent that is technically required. In no case will this data be sold or passed on to third parties for any other reasons. When troubleshooting a device by normal means (e.g. ticket support, e-mail, phone) is unsuccessful, AKiTiO may suggest remote assistance. In order to fix the issue, AKiTiO will connect to your device and access the system files. It may be necessary to move or rename certain files but your data will only be accessed to an extent that is technically required. Remote assistance is only established with your prior consent and you have the chance to decide whether or not to accept it. If you have any queries about this policy, please feel free to contact us at privacy@akitio.com.